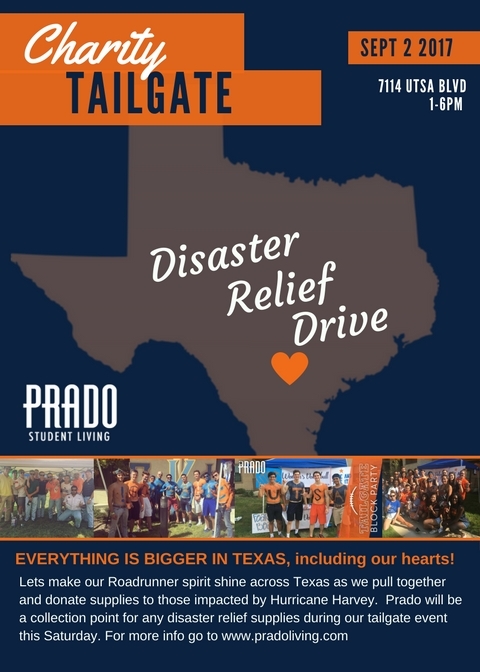 Join Prado at our courtyard tailgate disaster relief drive Saturday, 9/2 from 1-6pm. This year we will do our part to tie in a disaster Relief Drive to help the victims of the recent storm that blew across Texas. We are asking all organizations, students and faculty to partner together and show the Roadrunner spirit shine across Texas as we collect disaster relief supplies. To help the various communities that have been affected by Hurricane Harvey. We are taking food, clothes, hygiene products, pet food, baby food/clothes, as well as blankets. The participation of your members can help your organization win big! The top two organizations that show the most spirit and donate the most supplies based on our point system, will win $500.00 towards their organization! Even if you are not participating with a registered organization we are accepting all donations. Everything counts for the families that have been victimized by the storm. Below is a list of items that we will accept along with the amount of points each item will accumulate. Each member who shows up and attends on behalf of their organization and registers by 3pm will get 10 points for their organization. Each member who shows up and attend on behalf of their organization and registers by 4pm will get 5 points for their organization.